The commonly used bipolar transistor — in which electrons or holes pass through two PN semiconductor junctions — is essentially a current amplifying device. Although voltage can be amplified indirectly if the “common emitter” or “common collector” wiring configurations are used, it still is true that a small amount of input current must always flow into the transistor’s base region for control purposes. Another type of semiconductor device, the field effect transistor or “FET,” is not as familiar to many electronics hobby enthusiasts, possibly because it is easily damaged by misuse. The FET amplifies voltage directly, and the current needed for control is so low that it cannot be measured with common instruments. This transistor was actually the first type of semiconductor amplifier predicted theoretically at Bell Labs, back in the 1950s, but it was not developed into a practical device until after the bipolar type had become popular. However, FETs have now become the most common type, with tens of millions of them in each microprocessor IC chip. With such a huge number of transistors operating in a single chip, we certainly don’t want much current to be required for the control of each one — the battery power would be used up fast, and a lot of heat would have to be removed. Also, there are many other applications where super-low input current is desirable. An obvious example is in the first stage of an accurate voltmeter, where we don’t wish to cause any new voltage drops by draining current out of the circuit being studied. At any rate, the FET responds entirely to voltage at the controlling electrode, and this can be used to throttle fairly large amounts of output current and/or voltage in the other two wires. Instead of making a transistor that conducts through both PN junctions when it is turned on (“bipolar”), one type of FET transistor can be made with just a single PN junction (“unijunction”). Since it does have a junction, it is called a juncFET or JFET, and a simplified cross section diagram is shown in Figure 1. FIGURE 1. Simplified cross section of a JFET, with an operating circuit. It is N-channel, depletion mode, and normally on. The symbol is at the right-hand side of the figure. One metal electrode is called the source, one is the gate, and one is the drain, similar to the emitter, base, and collector in a bipolar transistor. This is an “N-channel” device, because the current goes through N-type silicon. The symbol is shown to the right of the cross section. 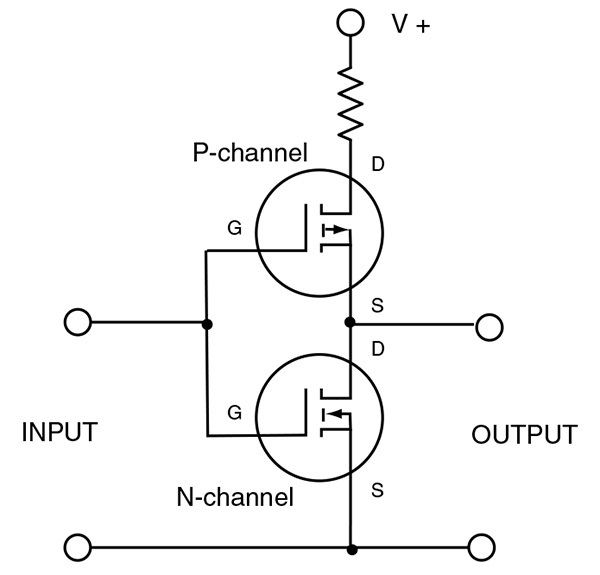 Another type of JFET, a “P-channel” device, has the opposite types of P and N semiconductor regions, so the arrow in the symbol is aimed away from the channel. That type of gate must be charged positive in order to turn off the channel by repelling holes. It is not as common as the one shown here, but it does exist, and it can be useful for special purposes. An interesting application for the JFET is in the “constant current diode.” The total effect of this is similar to that of a bipolar voltage regulator, except that current is regulated here instead of voltage. 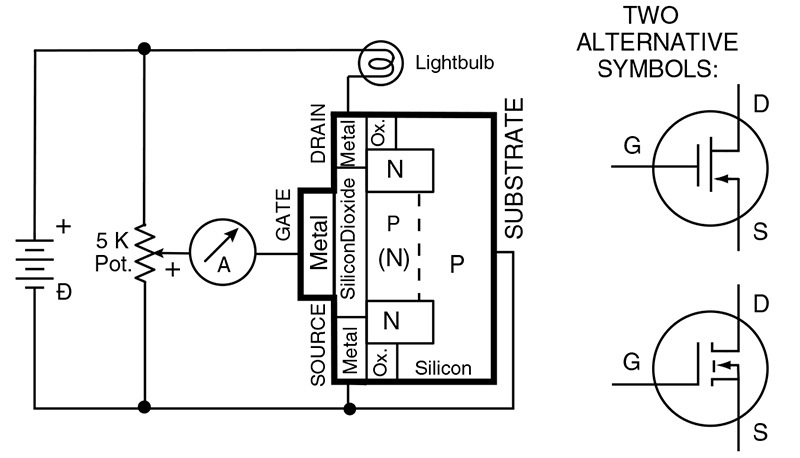 This can be a very simple circuit, as shown in Figure 2, diagram B. FIGURE 2. An N-channel JFET wired to be a constant current self-regulating device, with the symbol shown next to it on the left. The other two symbols, to the right, are for constant current sources that include power supplies such as batteries. Looking at the negative current that flows upward through the resistor, some of it will be sent to the gate, which partially turns off the FET. This is negative feedback, so if the current in the circuit starts to increase, then the transistor gets turned off even more. Thus, less current flows, until some constant current level is reached. 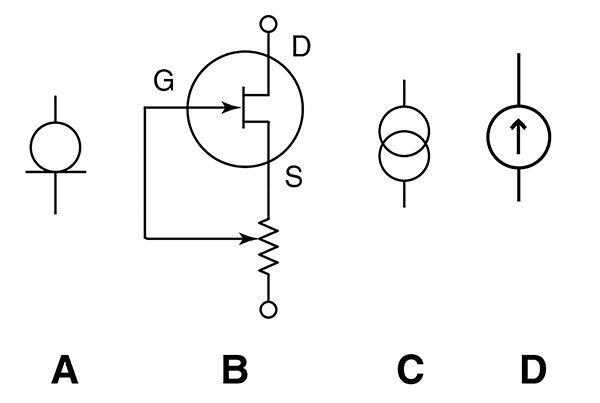 The JFET and potentiometer are all inside an insulating plastic “package.” That whole thing, plus a power source like a battery (not shown here), is symbolized by two overlapping circles, Figure 2, diagram C. Occasionally an alternative symbol is used, with an upward arrow, especially in Europe, as shown in diagram D.
A different kind of field effect transistor is illustrated in Figure 3, the metal-oxide-semiconductor or “MOS” device. FIGURE 3. Simplified cross section diagram for a MOSFET, with an operating circuit. It is N-channel, enhancement mode, and normally off. Two alternative symbols are shown at the right. If the potentiometer arrow is raised, and a positive potential is now applied to the gate, holes in the P-type silicon are repelled, causing this region to become N-type (as indicated by the N in parenthesis). Now there is no PN junction directly in the path between the upper and lower N-type regions, because it is all one continuous N-type region (drawn as a vertical bar, with the dashed-line as one edge). 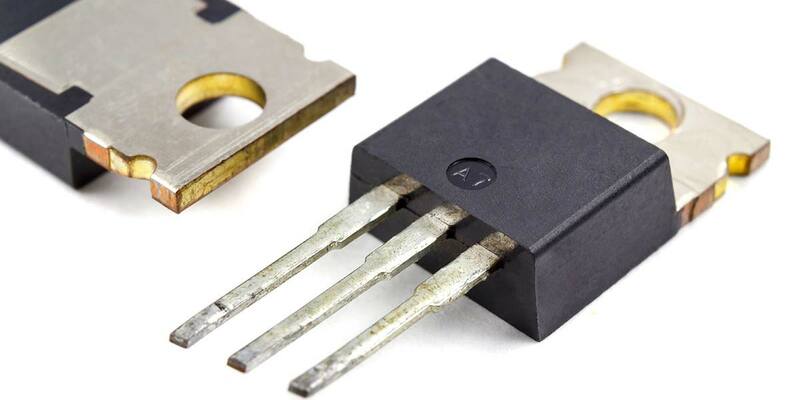 This transistor is also N-channel, because the electricity goes through N-type silicon when it is turned on. Symbols for the MOSFET are shown on the right. The arrow, in this case, indicates that the “source” electrode is internally connected to the substrate, which is often done if one of the PN junctions is not going to be used. If the device were P-channel, the source and drain would be P-type, and the arrow would be aimed away from an N-type substrate. Typical FET “spec sheets” use formats similar to those of vacuum tubes. The shapes of the curves are almost the same, but the voltages are usually much lower. The input is the VGS and the output is the ID. In this case, a type 2N7000 MOSFET is used in N-channel enhancement mode. A “load line” is shown here as a dashed line. Its slope represents the effect of a load resistance (such as the lightbulb in Figure 4), and it is quite valuable as a way to show the amount of current in any situation. FIGURE 4. Characteristic curves for a 2N7000 MOSFET, with a load line. 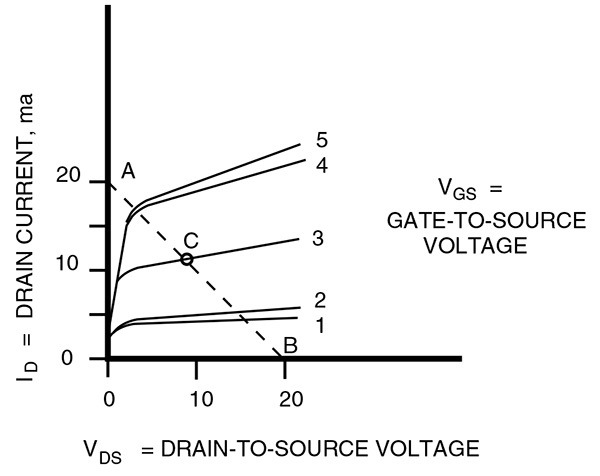 In the case graphed here, the load resistance is 1,000 ohms, and VDS is 20 volts. The dashed load line is drawn from the maximum possible voltage (shown here as B) to the maximum possible current with that particular load, which is 20V/1KW = 20 mA (shown as A). If the transistor is turned partly “on” (VGS = 3 volts), the drain current would be about 11 mA, as shown by the intersection (the circle under the letter C). Two MOS transistors of opposite type can be wired as in Figure 5, in the complementary MOS configuration (“CMOS”). FIGURE 5. CMOS transistor pair. The current is extremely low when there is no input signal. When no signal is fed to the input, one of the transistors is always “off,” so essentially zero current can get from the power supply down through the resistor, and then through the pair of transistors. When a signal comes to the input, then load current can be drawn from the output terminal, at either high (V+) or low (ground) voltage, depending on the polarity of the input voltage. However, in the situations when there is no input, the overall current is practically zero. Modern integrated circuits have millions of transistors attached in parallel, so if only a microamp of “leakage current” flowed through each one that was not being used, an ampere or more would still be drawn from the power supply or battery at all times. That would generate a lot of heat and also drain batteries too fast for portable devices. Therefore, almost all modern calculators, laptop computers, cellular phones, etc., use CMOS circuits whenever possible. The MOS transistor is particularly susceptible to damage from static electricity, of the kind generated when a person walks across a rug in dry weather. The spark that the person makes when touching the metal faceplate on a light switch is called electrostatic discharge, or “ESD,” but damage can be done to a MOSFET, even if there is not enough static to make a visible spark. Use a grounded wrist strap.